The Canary Islands or the Canaries as they are sometimes called are twelve volcanic islands east of the north west coast of Africa and known to be attractive for their subtropical climate, beaches and beauty spots and interesting history. While each is a popular vacation destination, the largest, Tenerife, Fuerteventura, Gran Canaria and Lanzarote, are best known internationally. 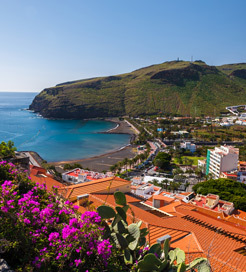 Tenerife and Gran Canaria are Spain's second and third largest islands, the sites of this autonomous Spanish territory's twin capitals and home to most of the island group's two million residents. Predominantly Spanish speaking, the population is a mixture of mostly Roman Catholic natives and migrants, many from mainland Spain. Tenerife has two airports and four ports, and each of the other major islands has an airport and port. Gran Canaria has the largest airport and port, but Tenerife is a busier hub. There are inter-city trams and local buses on larger islands. 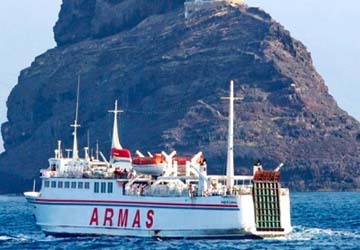 Though the majority of Canary Island ferry crossings are inter-island, you can get there from mainland Spain too via the ports of Cadiz and Huelva in the south west which connect you to the islands of Gran Canaria, Lanzarote and La Palma. Crossings from mainland Spain to the Canaries are long, though the ships are generally of a good standard so the journey should be a pleasant one. If you’re flying in to one island before onward travel to another, then the main hub in the Canaries is Tenerife due to its airports, geographical position within the group of islands and the fact that you can reach most of the other islands from it. Would wholeheartedly recommend this ferry crossing, fast, efficient and a pleasure in itself - esp. watching pilot whales!